You’d have to come from another planet, or be under the age of 5, to not know anything about “The Wizard of Oz.” For those of us who were not born in the earliest parts of the last century, it is the film we think of. In the pre-Internet age, the film’s annual appearance on television was a major family moment. At the dawn of the digitizing age, the film was even used to ridicule colorization (“If they had their way, they’d colorize the first ten minutes of ‘The Wizard of Oz'”). In my personal sphere, a dear friend’s mother is one of the last surviving cast members of the film, having played a munchkin as a child. Few really stop to remember that “The Wizard of Oz” was originally a book – the first in a long series by L. Frank Baum (and, eventually, others). In its third life, the story has become a stage musical, using the material from the film, including a song left out of the original and the very 30s introductions once added to others. This musical has arrived at Candlelight Pavilion Dinner Theater in Claremont as a chance for kids on vacation, and their families, to beat the heat, eat a lovely meal, and be transported over the rainbow. And, for the most part, that’s what they will get. The production, though there are a few creaky bits, makes the most of the small Candlelight stage, thanks in part to Chuck Ketter’s many, many backdrops and set pieces, and to the expansive performances – especially one – under the direction of John LaLonde. The trick with any stage production of a musical film is to not try to compete with the movie. Here that’s hard, as so many have the thing virtually memorized. Still, Jaidyn Young, who shares the part with Sydney Dawn, makes an earnest and innocent Dorothy, singing the signature “Over the Rainbow” and holding her own as a dancer. Jesse Ashton Rhodus gives Scarecrow an appropriately loose-limbed quality, and a quietly positive air. Andrew Lopez, though handed the most unfortunate costume, becomes a very earnest and heartfelt Tin Man. Still, the best of this group is Austin Rea’s take on the Cowardly Lion, which eschews Burt Lahr’s Borscht Belt humor and Brooklyn accent for a deeply earnest innocence which plays beautifully and more originally with the rest of the group. Also worthy of note are Jim Skousen’s apologetic wizard, Candace Elder’s concerned Aunt Em, and Michael J.Isennock in the dual roles of the Mayor of Munchkin City and Nikko, the captain of the flying monkeys. Sami Nye’s cheerful Glinda balances Courtney Bruce as the Wicked Witch of the West. As the show’s villain, Bruce has a great time, and handles the quick comings and goings with comparative ease, but sometimes gets so wound up by her own villainy she becomes difficult to understand. There are a few technical issues as well, most particularly in the generally charming approach of Glinda’s bubble (oil that contraption – it shouldn’t squeak), and the decision to use blinking lights in the essential witch-with-a-firey-broom sequence (which don’t turn off when needed). Also, one wonders if it might be possible for the twister to be less static, though the way of presenting those things caught in it is clever. Still, the choreography by Kim Eberhardt makes even the restored, if somewhat odd, “The Jitterbug” interesting. The magic of the Wizard and the disappearance of the Witch both prove quite effective, and the consistent use of a very competent children’s ensemble along with the usual chorus gives the thing a vitality and charm which proves the most important thing in the piece. In the end, this “Wizard of Oz” has many more pluses than flaws. And, although you may find yourself repeating an awful lot of the words along with the actors – at least in your head – take the time to look around at the children in the audience. They are having as good a time as the kid in the balcony who waved at Glinda’s bubble every time it went by, on opening night. Note that there is a specific children’s menu for this show, complete with theme-based drinks. Sometimes one goes to the theater for something profound. Sometimes one goes for something which will leave behind an underlying message to be chewed over a bit for its power or its emotional impact. Sometimes one goes to the theater for distraction, and for fun, with nothing more profound required than songs, dances and general earnest silliness. When this last is your goal, what better show than “42nd Street”? And what better venue than Candlelight Pavilion Dinner Theater, where you get to add a charming dinner to the mix. There are three things necessary for a production of “42nd Street” to succeed. First, corny though it is, it must be played straight. Second, just about everyone in the cast has to be able to tap dance, and well. Third, the leads must radiate an innate innocence. All of these can be found in Candlelight’s production. The tale, silly as it is – and borrowed from the 1933 movie of the same name – uses the music of Harry Warren and Al Dubin, who wrote songs for a string of Warner Brothers hits in the early era of sound. The classic story of “small town girl makes good on the Great White Way” blends all of the elements which made those early talkies historic. Peggy Sawyer, newly in New York from Allentown, Pennsylvania, manages to snag a part in a Broadway show which, at the height of the Depression, is a lifesaver for many of the “kids” in the cast. In this she is aided by Billy Lawlor, the show-within-a-show’s youthful tenor, though she runs up against the pompous, aging Dorothy Brock, who is not only the star of that show but has brought along the sugar daddy who will fund the production. When Dorothy breaks an ankle, exacting director Julian Marsh must search immediately for a replacement or the entire show will fold. Will Peggy be up to the leap which will make her “go on a showgirl, but come off a star”? Director/choreographer DJ Gray has a strong command of this particular genre of musical, and has gathered a fine cast of dancers to provide the backdrop to the storyline. Indeed, top quality tap sets the stage for the rest of the production’s finest aspects. Emma Nossal gives Peggy the sweet combination of determination and innocence so necessary to the atmosphere of the show, and sings and dances up a storm. John LaLonde’s commanding presence and deeply resonant voice make him a perfect Julian Marsh. Michael Milligan gives Pretty Lady’s (the show within a show) youthful tenor the combination of ego and zing necessary to make him an engaging foil. Sarah Meals does well as the pompous, aging star of the show, while John Nisbet has a lot of fun as the kiddy car king able to finance the entire production. Shannon Gerrity leads the chorus in support of Peggy’s chances, while Cynthia Caldwell and Josh Tangermann, as Pretty Lady’s writing team, become more actively engaged in the performance of the thing than usual. Among a large (by Candlelight standards) and highly gifted chorus, Chad Takeda proves a standout as the slinky thief in an otherwise period tap ballet to the show’s title tune, rather as if Bob Fosse’s choreographic concepts had invaded that sphere. Gray has a strong sense of the purpose of this kind of show, and that is evident throughout. The costumes and wigs are right. The pacing and timbre of the piece keep it light and mildly silly. The skills of the performers are solid and highly entertaining to watch. The singing, under the musical direction of Douglas Austin, proves so organic it makes one forget the fact the orchestra was recorded ahead of time. In short “42nd Street,” as done by this company, is all one can hope for with a show of this type. That it comes with a lovely meal means one can guarantee a lighthearted, upbeat evening. In times like these, opting for the occasional bit of fluffy froth isn’t necessarily out of place. The progression of the classic 1961 musical “How to Succeed in Business Without Really Trying” from Pulitzer-winning popular satire to dusty antique to fascinating period send-up of the “Mad Men” era has admittedly been fascinating to watch. Its dated attitude toward womanhood, its assumptions of businessmen’s sexual shenanigans, and its underlay of nepotism and testosterone kept it for a long time relegated to rather sad revivals by its aging original stars, as it moved further and further away from the social current of the day. Then, with time (it is, after all, over 50 years old now), its original charm seems reborn as it looks back on a singular era of American history. And when looked at that way, its sheer silliness carries the day. Now in a good revival at the Candlelight Pavilion Dinner Theater in Claremont, “How to Succeed…” has a kind of winsome, ridiculous charm. At least it does when – as in this production – you find the leading man up to the task of making unadulterated ambition look cute. The story follows the adventures of one J. Pierrepont Finch, a window-washer who uses an advice book on success to climb the corporate ladder in record time. In the process he cheerfully manipulates as many of the inner circles of corporate power as he can muster, all the while thwarting the CEO’s inept and entitled nephew. His exploits are celebrated by a company secretary, Rosemary Pilkington, whose fondness for him threatens to derail his single-focused effort to move up. Three essential elements are needed for this to work. The first, as has been said, Finch must be charming as well as ambitious. Dino Nicandros proves more than up to that task, managing a combination of silliness, slapstick and sincerity which creates exactly the right tone throughout. Secondly, the supporting characters – a lot of them – must be clever and energized. No problem there. Jared Ryan Kaitz makes the boss’ nephew just as slimy and whiny as he should be. Sallie Griffin makes Rosemary gently stereotypical, and pleasingly normal in a crazy storyline. Steve Gunderson gives just the right amount of ridiculousness to the oblivious CEO. Krista Curry all but steals the show as the naive bombshell Hedy LaRue, and Jennifer Wilcove stuns in the last number, when the boss’ secretary lets her hair down. Lastly, the whole cast has to be able to sing and dance, in choreography which makes the most of the wry lyrics. The entire ensemble – large by Candlelight Pavilion standards – manages this impressively well, and DJ Gray’s choreography is up to the task most of the time. Indeed, the choreography of “Coffee Break” is funny from start to end, though “A Secretary is Not a Toy” never seems to quite find its thematic core. Director John LaLonde has a gift for creating continuity in this very episodic tale, aided by Chuck Ketter’s impressive, and impressively mobile set. One other major plus is the wigs, by Mary Warde and Michon Gruber-Gonzales, evoking the era of big hair without being so corny as to distract. “How to Succeed in Business” spoofs all the elements of the era in which it was created. For a while, the memories of the inequality and boy’s club mentality of that time were near enough to set one’s teeth on edge, but now – with the passage of years (and, quite frankly, a woman as a legitimate candidate for the Presidency) – it has become less annoying than oddly nostalgic. Like the far more serious “Mad Men,” it evokes an era which both fascinates us and reminds us of how, in so many ways, we’ve grown up. Come take a look. You’ll get a lovely meal into the bargain. One looks back at the work of Andrew Lloyd Webber and Tim Rice, both what they did together and since their split, and it is difficult to find any single piece more significant than their musical “Evita.” The music, though typically repetitive, has far more verve than much of Lloyd Webber’s later work, and the sharp-edged lyrics Rice created for this odd but fascinating story have an intensity which matches the score. For this reason, I am always on the lookout for a production of “Evita.” It can still have a lot to say. Yet, there are certain things which simply must be present, especially two truly dynamic performers, one to play Eva Peron herself, and one to play the narrator, revolutionary Che Guevara. It can be high tech or low, large cast or smaller, but if these two parts aren’t cast with people of strong voice and stronger personality, it doesn’t work. Which brings me to the new production of “Evita” at the Candlelight Pavilion Dinner Theater in Claremont. Years ago, when the musical was new, I saw the first truly low-tech version of the show at Candlelight, and was impressed by how well the show held up without all the fancy machinery or the huge cast. I wish I could say that this new production was as successful. Despite a solid production, and a good to very good ensemble to back up the central figures, there is still a problem. Richard Bermudez makes fine work of Che: angry, sarcastic and powerful by turns. John LaLonde takes what has to be one of the most underrated parts in modern musical canon, Juan Peron, and makes him a real personality. But sadly these strong personalities only emphasize the comparative lack of zing in Laura Dickinson’s Evita. She does all the moves, and – though sometimes her rock-style high notes become too shrill – handles the difficult music with a reasonable style, but the energy which creates this actual, larger-than-life character is absent. This is not the woman thousands of descamisados would have muscled into (albeit surrogate) power, who would have charmed all the charmable of Argentina. The fire is missing. Which is admittedly a pity, because Chuck Ketter’s direction of the show moves it from its big-stage roots to the small and intimate Candlelight space without losing its most essential bits. Roger Castellano’s choreography almost has to be derivative of the original, but is generally well done. Admittedly (and this was also true the first time) one misses the projections which enhanced one or two moments, but doing “Evita” low-tech is also a great way to prove the show’s actual power is not based on gimmicks. And by and large this is still true. Except when it isn’t. Indeed, there are a few lost moments, not all of which can be laid at Dickinson’s feet. The staging of Alexandra Specter’s brief moment in the sun as Peron’s dismissed mistress leaves her without the anchor of a door. 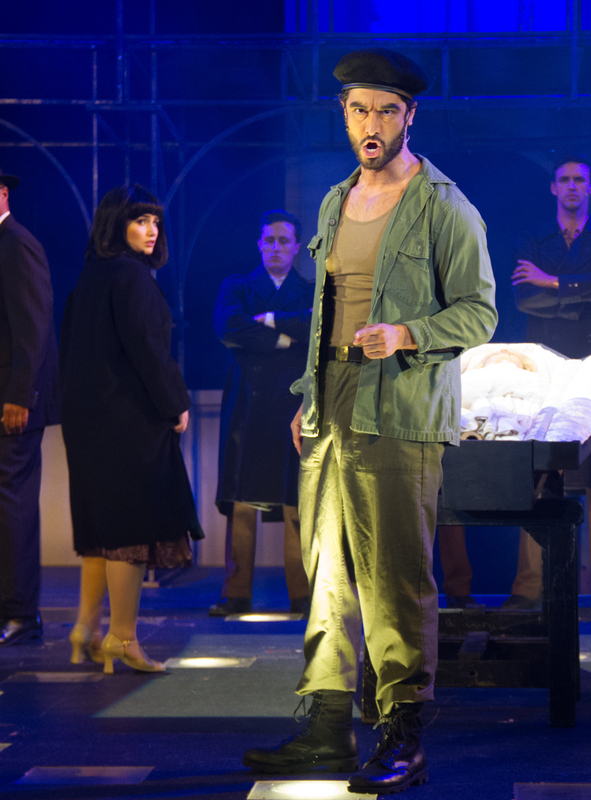 Lucas Coleman’s turn as Magaldi, the tango singer who takes Eva to Buenos Aires, lacks fluidity or the kind of oily sexiness which makes him interestingly small-time. Also, and very disappointingly for a show in which one can be swept up by orchestral moments alone, the score (always a recording at Candlelight) makes significant use of electronics rather than actual strings, robbing the music of its richness. 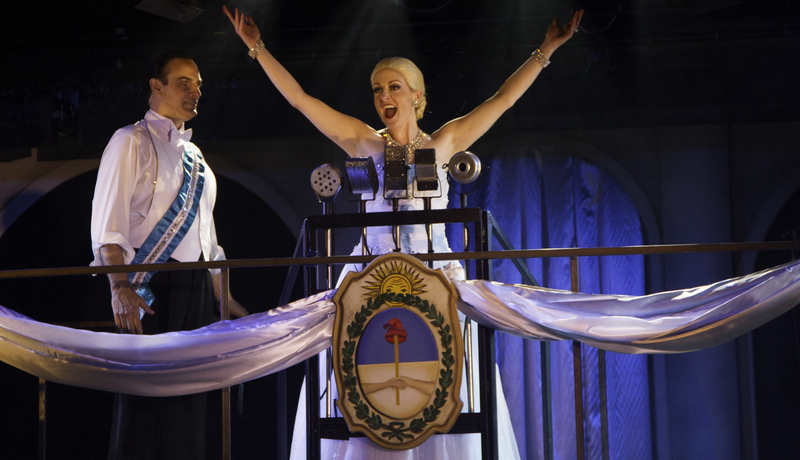 So, should one see this “Evita”? It has things to recommend it, and it comes with a fine meal. Is it what it could have been, at this venue? Not really. Having seen what this theater is capable of in relation to this important work, it should be better than it is. There are a lot of reasons to go to the theater. One is simply for entertainment. 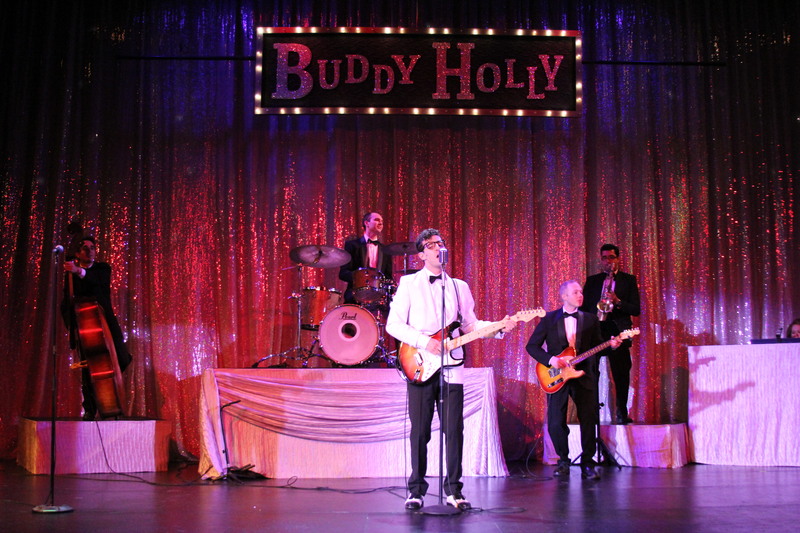 If that is your goal, and particularly if you love musical nostalgia, you’ll have fun with Alan Janes and Rob Bettinson’s “Buddy: The Buddy Holly Story,” now at Candlelight Pavilion Dinner Theater in Claremont. Though this musical does tell a rather simplified version of the small segment of Buddy Holly’s life between the first contract he signed with Decca in 1956 and his death in the airplane crash which also took the lives of The Big Bopper and Ritchie Valens in 1959, it is mostly a concert of the music he recorded within that time. With that in mind, it becomes important that the leading man both look and sound like Holly, and – if possible – be able to play a decent electric guitar. Jared Mancuso manages all of this. Indeed, at least in the looks and the sound category the result is almost spooky. As his back-up band The Crickets, Julian Johnson, as Joe, is a virtual gymnast with a string bass, Lonn Hayes gives considerable character to drummer Jerry, and Cullen Law’s Cricket offers a mean second guitar. Virtually all of the rest of the performers become the “ensemble,” stepping out to play important folk in his life, then becoming back-up singers, enthusiastic fans and whatever else is needed. Of these, Jade Rosenberg is sweet as Buddy’s young wife Maria Elena, John Nisbet has fun with Hi-Pockets, the DJ who first gets him on the air, David Laffey has some strong moments as the man who managed them to stardom, and Jennifer Strattan makes fun work of that managers insistent wife. Also worth a nod within that ensemble are Robert Hoyt as a fairly convincing Big Bopper, and Orlando Montes, who – though he looks decades older than the 17-year-old Valens was when he died – sings a mean “La Bamba.” Indeed, more than half of the second act of “The Buddy Holly Story” is devoted to Holly’s final concert, with Valens and The Big Bopper, before they all stepped on that fateful plane. That is probably the best of this entire show, with so many great hits, the entire rest of the ensemble singing backup, and a solid sense of the era and the vitality of early rock-and-roll. Bravo to director John LaLonde, for keeping the pacing constant, and for understanding what the focus of it all had to be. This is not a show for the intellect, but for the heart and the tapping foot. Even knowing that the show ends with the singular finality of Holly’s story, everyone leaves the performance space bouncing and singing. And sometimes that’s what going to a show is all about. There is no real attempt to hide that this is a tribute rather than a biography, and that’s just fine. At Candlelight Pavilion, the entertainment comes wrapped in a tasty meal and some singularly impressive desserts at intermission. So, leave your burdens at the door, go in, eat, talk, drink, and if the spirit so moves, dance in the aisles. Sometimes, it really is just about being entertained. Here, you will be.